Touch control for easy operations: Touch to Turn ON / OFF, Touch and Hold for No Dazzling Multi-levels of Brightness Adjustment. 1800 mAh rechargeable Li-on battery power for wireless operation lights up at least 3-6 hours. 18 pcs Energy-efficient LED bulbs are built in the round shaped lighting head, supporting evenly eye-friendly soft lighting. Personalize the mood of your room's atmosphere with a full color spectrum of base lighting control, from pink, purple to yellow, blue. Flexible and bendable lamp neck for simple light angle adjustment. 3750-4250K more comfortable light color for most people. High-end quality, same factory who manufactures for Costco, Target, etc. Beyond Amazon's A-Z claim policy, you are also backed by Surpahs' 100% satisfaction guarantee program. - State-of-art LED lighting technology, no dazzling. - Energy-efficient, Eye-friendly soft lighting. - Built-in rechargeable 1800 mAh Li-on battery power for wireless operation lights up at least 3 hours. - Includes a micro USB cord for charging and wired operation. 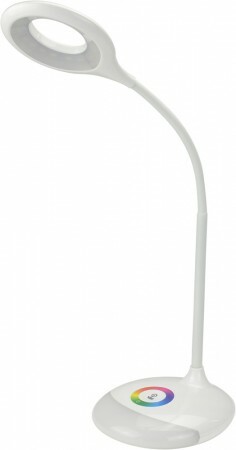 - Flexible and bendable lamp neck for any light angle adjustment easily. - Customize base lighting colors and personalize the mood of the atmosphere.